It only took me fifteen years, but I finally finished The Legend of Zelda: A Link to the Past. See my previous post for a little bit of my history with the game. It feels good to finally close the book on this classic. Having previously played most of the other games in the Zelda series, I can definitely see how much of an influence this game has had on Link’s other adventures. One thing that sticks out to me after completing the game is how tough it was at times. There were a handful of moments during the game when I just had to take a break and return to it later. While frustrating in the moment, these are the challenges that make completing a Zelda game such a memorable achievement. Flying tiles continued to catch me off guard throughout the entire game. What makes this boss fight so difficult is getting knocked off the stage and having to make your way back to the top to begin the fight again. This probably took me six or seven tries. Pulling the Master Sword is always one of the most exciting moments in any Zelda game. Escorting the super bomb to gain access to the silver arrows was an interesting challenge. Defeating Ganon is always satisfying. Overall, I really enjoyed the game, and it was fascinating to see all of the framework this game laid for subsequent Zelda games. 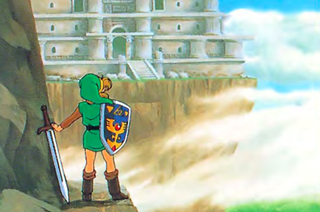 It is obvious to me now why A Link to the Past is held in such high regard and continues to rank near the top of most greatest games lists. Take a break Link. You earned it.